This weekend my husband did something that I always wish he would do, but that he generally never does. No, I am not talking about buying my flowers (although, I wouldn't mind that!). He actually requested that I make a certain thing for dinner: John's Fish, which is Tilapia with Tomatillos and Avocado filled with Maque Choux. This one is named after Rachael Ray's husband, John, and is one of his recipes. The flavor is outstanding, especially if you don't like really fishy tasting fish. 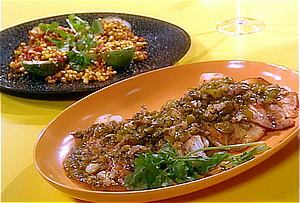 The tilapia soaks up all the smoky flavor from the cumin and the beer compliments the light texture and taste of the fish. Buy an extra lime, stick a slice in a Corona bottle and have it with dinner! Tips: I recommend washing your hands immediately after chopping the jalapeno or holding the peppers with a paper towel with one hand while chopping the other. Otherwise, you will have jalapeno juice burning your hand all night. Splitting: When I split meals in half, I usually make the whole recipe for the sauce, but this sauce could actually be split in half easily. I made the whole recipe for the sauce and had way too much. However, I did make the entire avocado recipe just for the two of us, so both of us ate an entire avocado. Avocados are good fat, right? I am looking forward to fresh corn in the summer instead of using the frozen.